The Lyttelton II was entirely steam driven. The two big boilers provided steam to operate the main propulsion engines but also the engines powering the rest of the functions of the ship. The ship builder made the main engines but bought in the rest of the pumps and engines In all there were 17 steam engines and pumps all of which are on display. Many of the engines have been set up to run on compressed air and a project is currently under way to get them operating under steam. On the last Sunday of the month and over the rally weekend the engines can be seen in operation. Click the labels below to view some of the engines. To move the link to reverse the rotation the crankshaft and propeller steam driven reversing engines are incorporated on each main engine. Mactaggart-Scott engines 7” bore x 9” stroke are used. Lyttelton II was equiped with two boilers. These were three furnace Scotch Marine wet-backs manufactured by Barclay & Curle and Co. They were coal fired with Hotchkiss recirculators. Their working pressure was 180psi. 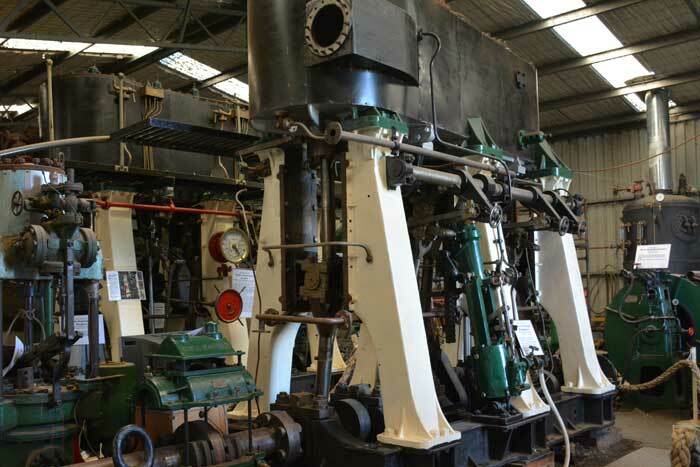 The boilers are on display at the club but there are no plans to restore them. They took 24 hours and three tons of coal to raise steam - not a practical proposition in a museum context, not to mention the enormous task and expense that would be involved preparing for annual boiler inspections. The boilers had forced draught supplied from a Howden forced draught system. The steam engine driving the fan had a 4” bore x 3” stroke. The exhaust steam from all the engines exhausted into a condenser where it was condensed and the water reused in the boilers. Sea water was sucked abord and passed through a large number of tubes in the condenser to cool the steam then emptied back into the ocean. The Condenser circulating pump was a Centrifugal pump manufactured by Drysdale driven by steam engine 5” bore x 4½“ stroke. It circulated 8180 litres per minute @300 rpm. The Weir feed pump system has two 6" pumps each with a capacity of 22,000 lbs per hour. The pumps sit on top of the hot well containing condensate water from the air pumps.They are plumbed to operate individually with valving to source the feed water from the hot well or from the fresh water tanks or sea water as required. Fresh water was reticulated around the tug from the fresh water tanks on deck by a pump Dawson & Downie 3” pump. The tug had power steering courtesy of a MacGregors Steering Engine. The engine was in the engine room with rods linking it to the wheel on the deck. It could alternatively be operated from the engine room. In the situation where the tug was out of steam and under tow the engine was disengaged and the tug steered manually using the attached wheel.